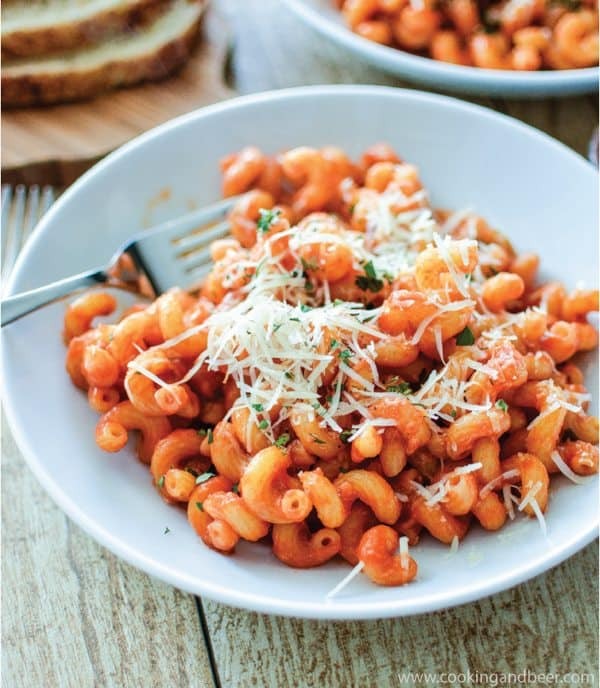 Pasta with Garlic Tomato Sauce is a must-have for a quick weeknight meal option! Perfectly al dente pasta is tossed in a rich and hearty tomato sauce that has been spiked with the essence of garlic and an herby freshness that can’t be matched! 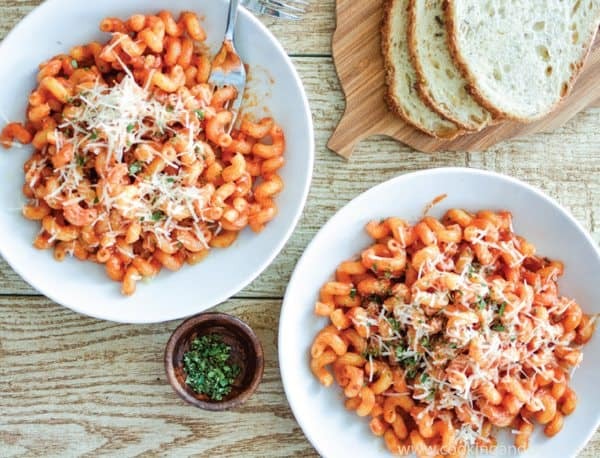 Sprinkle it with a dash of fresh parsley and freshly-grated parmesan cheese, and this pasta with garlic tomato sauce will disappear from the dinner table in just minutes! Hey there Melrose Family readers! 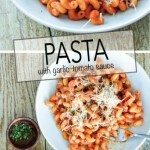 Justine from Cooking and Beer here to share one of my favorite go-to weeknight dinner recipes: this pasta with garlic tomato sauce! Oh sure, it sounds simple (and it is! ), but it is so much more than that. This pasta recipe packs a punch of flavor that is difficult to match and is ready in just minutes! 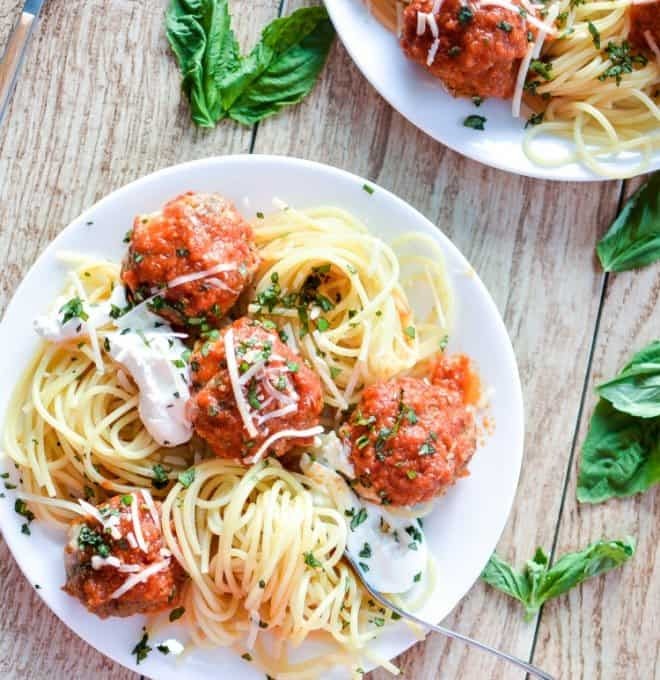 It’s one of those crave-worthy recipes that I need after a long day of work, and I hope all of you find some comfort in it as well! So in order to give you guys some background on how a dish like this was born I’d have to backtrack a couple of months, and since I have the tendency to ramble on and on about basically nothing, I’ll keep this story short and sweet. No one has time for that. So anyway, my better half and I just sold our first home and moved north from Colorado to the great state of Wyoming. Easy dinners concocted from pantry staples were necessary. As I ATTEMPTED to clear out my pantry, many many many pasta dishes were born. This pasta with garlic tomato sauce is just one of those pasta dishes. I had a lot of dry pasta. It was kind of scary actually. It’s all very simple. You start with a head of garlic. YES, a head of garlic. This garlic is sauteed in olive oil along with 1/4 cup of yellow onion until fragrant. A scoop of tomato sauce, a hefty cup of vegetable stock, a mixture of oregano, basil, thyme, and marjoram, and a blend of necessary seasonings are thrown into the pan. Cooked until bubbly and thick, this sauce is then tossed with al dente pasta. 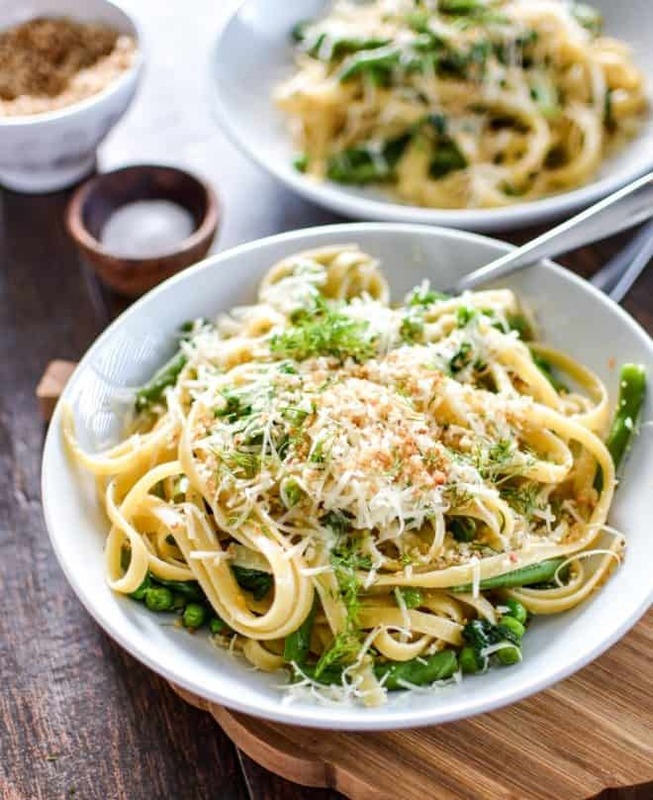 Sprinkle with a teensy bit of parmesan cheese and a generous amount of chopped parsley and Ta-Da! So easy right? I know, it’s crazy how easy dinner can be. I hope you guys enjoy this recipe as much as we do! 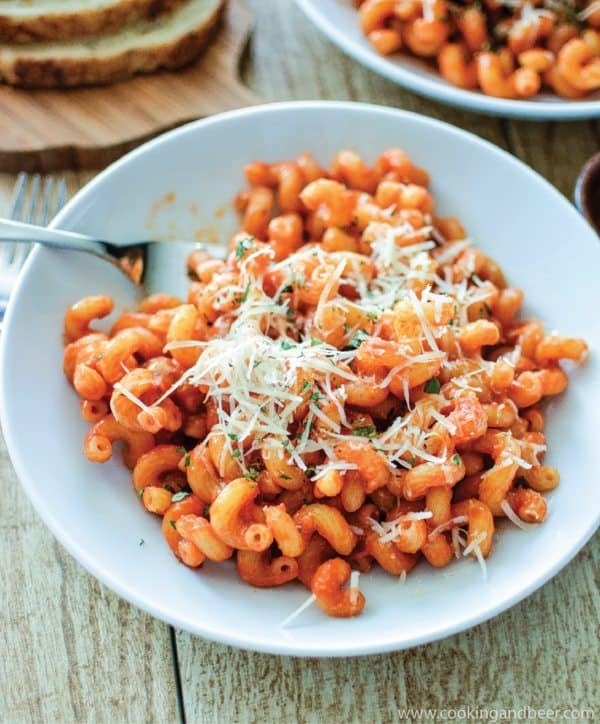 Pasta with Garlic Tomato Sauce is the perfect family dinner recipe. While the water is coming to a boil, prepare your garlic tomato sauce. In a large non-stick skillet, heat the olive oil over medium heat. Add the onion and cook for 3 minutes. Add the garlic and cook until fragrant, about 2 more minutes. Stir in the tomato paste and cook for 1 minute or until the tomato paste takes on a deep maroon color. Whisk in the vegetable stock until fully combined. Add more stock if you find the sauce to be too thick for your liking. Stir in the red pepper flakes, basil, oregano, thyme and marjoram. Season with salt and black pepper and cook over low heat for about 8-10 minutes. Keep warm on the stove until you are ready to serve. Add the pasta to the boiling water and cook until al dente, about 8-9 minutes. Drain and transfer to the pan with the tomato sauce. Toss carefully to coat. 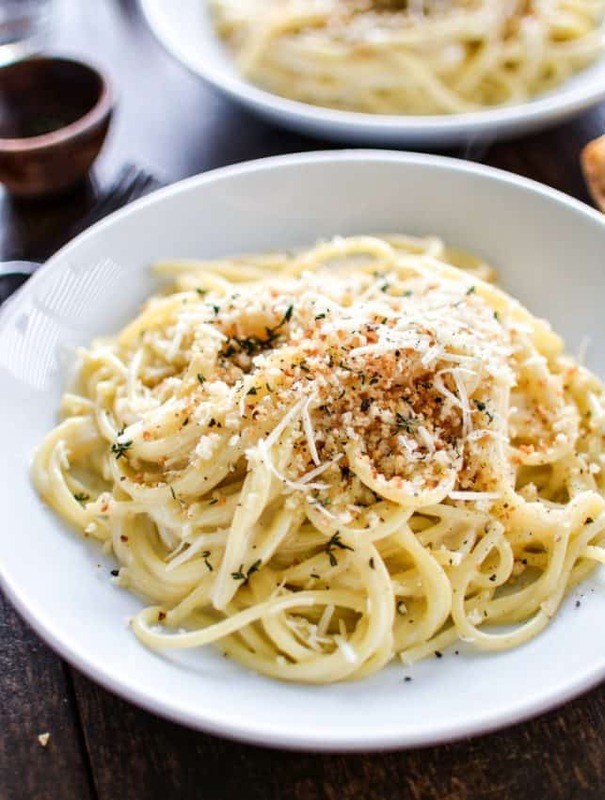 Portion the pasta out equally and sprinkle with freshly-grated parmesan cheese and fresh parsley. Like what you see today? Check out some of my other pasta recipes found over on Cooking and Beer where I’m combining bold and inspirational cooking (and baking) with the best craft beer I can get my hands on! I had Toum for the first time about 25 years ago in a Lebanese restaurant in St. Paul, MN. I would also puhscare small containers of Toum from a small Mexican-Lebanese grocery store several miles from the restaurant. I got hooked and turned into a Toum junkie. Unfortunately, my wife was in the early stages of her first pregnancy and she couldn’t stand to be within 25 feet of me after I had been eating the stuff or she’d experience severe morning sickness regardless of the time of day. We eventually moved too far away to get back to either establishment on a regular basis, which probably saved our marriage and allowed for additional children. I’ve found recipes for Toum previously and I succeeded in making it once or twice in a blender. More recent attempts to make it, however, have been dismal failures. I had Toum again in November at a South Bend, Indiana restaurant following a Notre Dame football game. It was as good as I remembered it and it rekindled my determination to make it at home. I tried my old method again with the same disappointing results. I found your recipe on this site and gave it a whirl. Wonderful! I think you touched upon a very important factor in your blog for those struggling with making Toum: Size matters. In my failed efforts I had tried to make proportionately smaller batches and ended up with lumpy, separated liquid. Larger amounts made in a food processor is the key to success. I, along with my menopausal wife and grown children, thank you!